A refined and intense Cognac with notes of red fruits, almonds, and pecans. 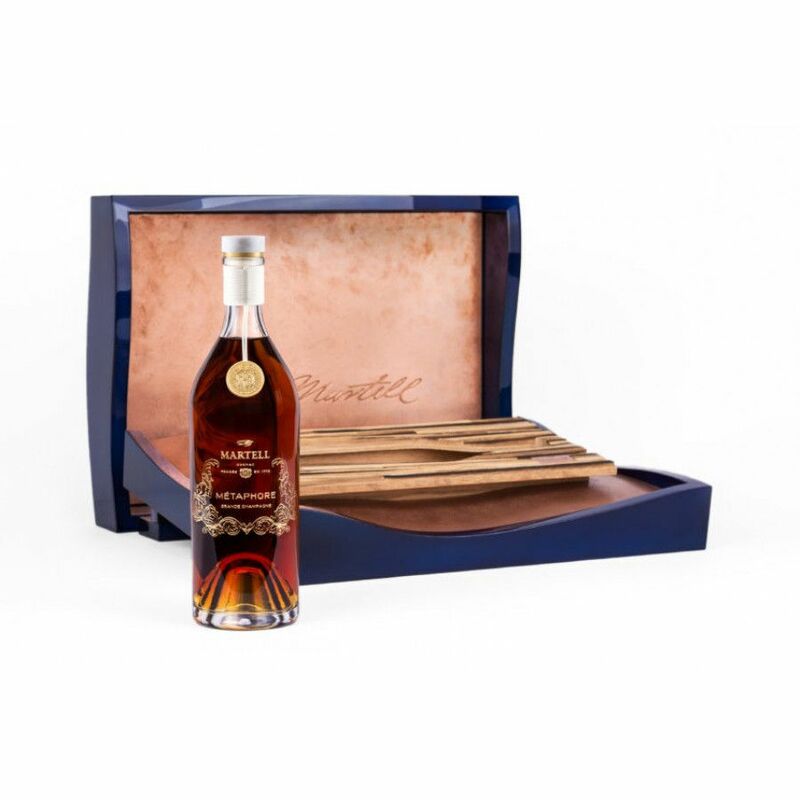 The Martell Metaphore Grande Champagne Cognac is a bespoke one off creation from this famous Cognac house. Cellar Master, Christophe Valtaud, has used four exceptional eaux-de-vie from the premier cru of the region to blend this unique product. The first eau-de-vie is from 1898, and was chosen by the very first Cellar Master of the house, Augustin Chapeau. The other three date between 1911 - 1920. The bottle itself is a traditional style, but the presentation case is a true work of art. Created by cabinet maker, Thierry Drevelle, of Les Grands Ateliers de France, it was four years in the making. He was inspired by the geographical features of the Grande Champagne region, and is both simple and thought provoking. The case also showcases the symbolic bird emblem of the house, and the Martell signature blue tones are designed in laquer, by artist, Mireille Herbst. Martell is the oldest of the big cognac houses. Similar to Rémy Martin, but a few years older still, Martell will soon celebrate its 300 year anniversary. The history of Martell & Co dates back to 1715, when Jean Martell founded the company with the wish to produce only the highest quality in cognac. With the legendary bottles Martell Cordon Bleu, Martell Extra L’Or de Jean Martell and the recent Création Grand Extra from 2007, the company strongly implanted itself in the luxury goods market. It belongs to Pernod Ricard and has sales of around 15 million liters every year. 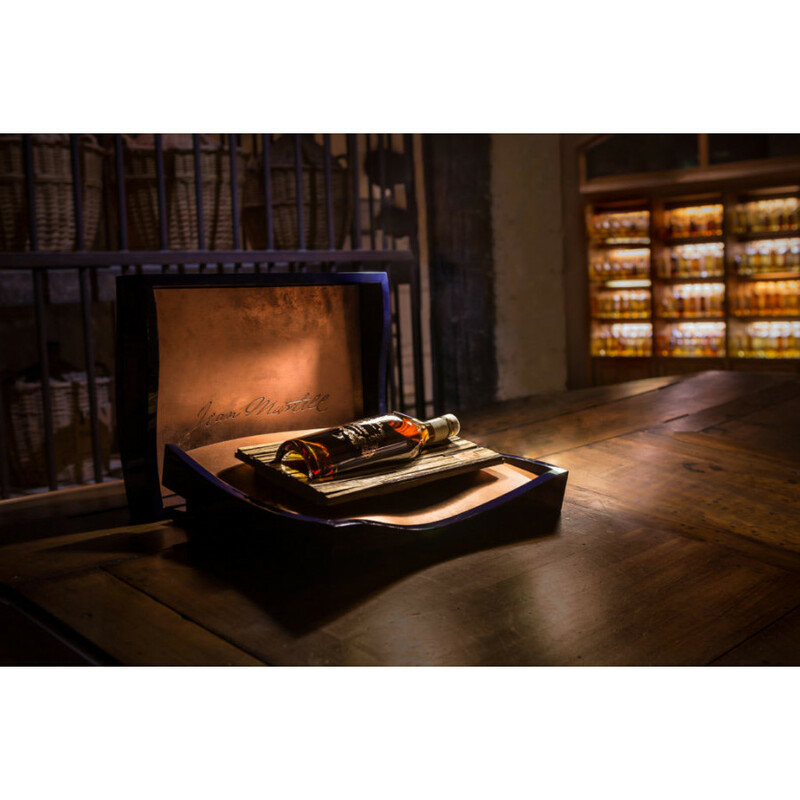 The most precious eaux-de-vie, some of which date back to 1830, are stored in a secret location in the cellars of Jean Martell - approximately 1,6 million 9 liter cases! Martell Cohibas nose is rather soft, mellow but complex. Some sweet notes, like vanilla, hazlenut and slight honey. In the mouth: Quite down the line, a good strength, but round and fresh - some wood aromas. The finish is well balanced. Tasting notes: Copper gold colour, with a nice range of different notes in the nose. In the mouth: Balanced hints of fruits, flowers, and spices. No tasting review yet of this very old Reserve by AE Dor. Tasting review: Nose: Floral, honeysuckle, delicate perfume of peaches and melon. Marzipan nuttiness & honey Palate: Almonds, peaches, orange, wood spices, cinnamon, and orange blossom. Finish: Truly satisfying, lingering, sweet oak spices, delicate grapes, and floral notes.